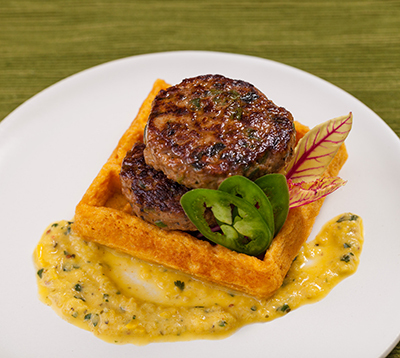 In the student division, Laurie Hartfelder from Nashville State Community College, captured the $5,000 Grand Prize with her deliciously spicy recipe for Duck Poblano Jalapeno Chili Sausage on Sweet Potato Waffles with Mango Pepper Relish. LEESBURG, IN (September 30, 2017) – Maple Leaf Farms threw a twist into this year’s annual Discover Duck Chef Recipe Contest by asking contestants to submit recipes that utilized duck legs or a duck leg product. Entrants rose to the challenge and submitted a variety of recipes ranging from duck bastillas to tacos and everything in between. Culinary students and professional chefs from a wide range of foodservice segments participated in the contest. Professional chefs competed for a $10,000 Grand Prize, with four additional $1,000 finalist prizes. Culinary students vied for a $5,000 Grand Prize, and four $500 finalist prizes. In total, more than $21,000 in prizes was awarded. Among the student finalists, Adam Conigliaro from The Restaurant School at Walnut Hill College was recognized for his gorgeous dish, Five Spice Duck Legs with Warm Pickled Fennel, Cherries/Persimmons, Persimmon Gel and Chrysanthemum Jus. Oyindamola Johnson of Escoffier School of Culinary Arts impressed judges with the creativity of her Duck Stuffed Plantain Schupfnudeln with Tomato Sauce. Richard Robinson of Chattahoochee Technical School submitted a recipe for Poached Pear Duck Salad with Orange Apple Cider Vinaigrette that delighted judges with fresh, light flavors. Richard McGunigale of Nashville State Community College submitted the ultimate comfort food with his Buttermilk Biscuits and Duck Gravy. Each student finalist will receive $500 and a knife set. While the requirement to use duck legs or a duck leg product resulted in a smaller number of entries in this year’s contest, the three Master Chef, who judged the first rounds of the contest were impressed with the caliber of the recipes submitted. Look for prize winning recipes and photos on the contest web pages here.